Mad Water is returning production of its product line to the USA. A bombproof duffel bag made for the outdoors is the brand’s first domestic offering. 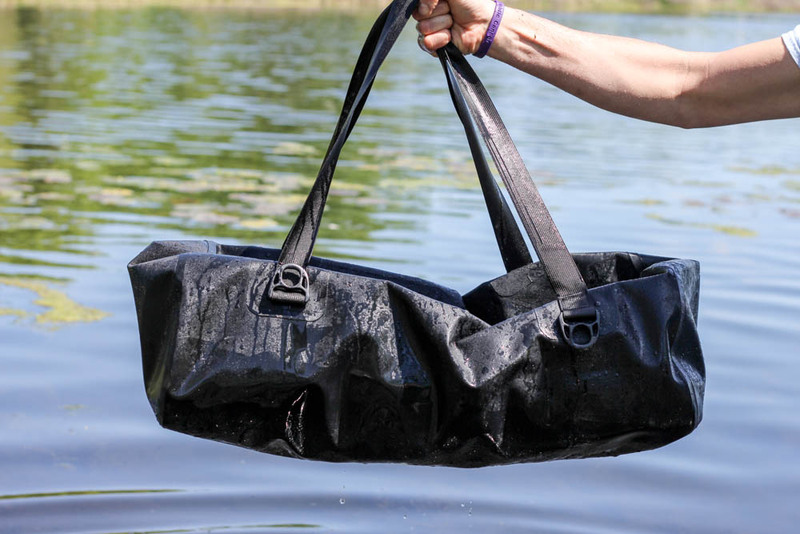 The Mad Water waterproof duffel, available in 30-, 65-, and 90-liter sizes, is simple, straightforward, and effective. It’s a polyurethane-sided carryall with only one zipper, and though the cost is high (starting at $160) the bag will likely last for decades if treated right. The webbing handles, D-rings, thread, product label, packaging – even the YKK waterproof zipper – are all USA-made. Once the company has found a viable source for the polyurethane shell fabric, the whole shebang will be produced and assembled domestically. Until then, more than 75 percent of the bag’s cost comes from U.S. labor, exceeding the federal requirement for the “Made in the USA” label. The Mad Water brand is a division of Roc Gear, which manufactures and wholesales outdoor gear. With the duffel, Roc Gear is beginning an initiative to move a significant proportion of its manufacturing back into the U.S. The Mad Water duffel, in matte black, is the first item touted as wholly produced domestically. We decided to put the duffel to a test. We could (and did) leave the bag out in the elements, enduring rain, wind, sun, and an occasional passing bird. 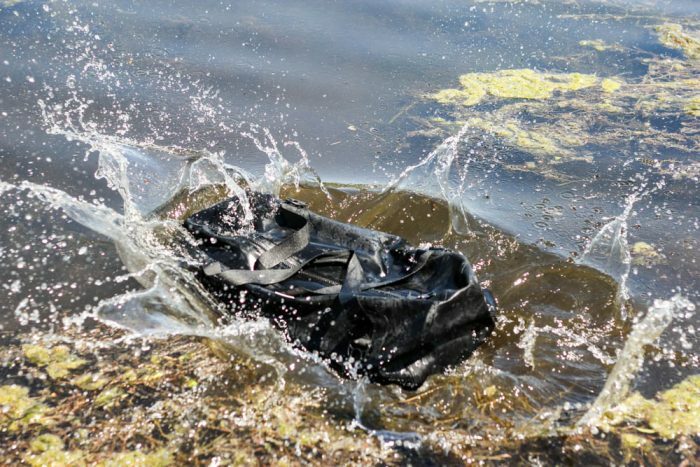 But to really test a waterproof bag, there’s no substitute for sinking it in a lake. 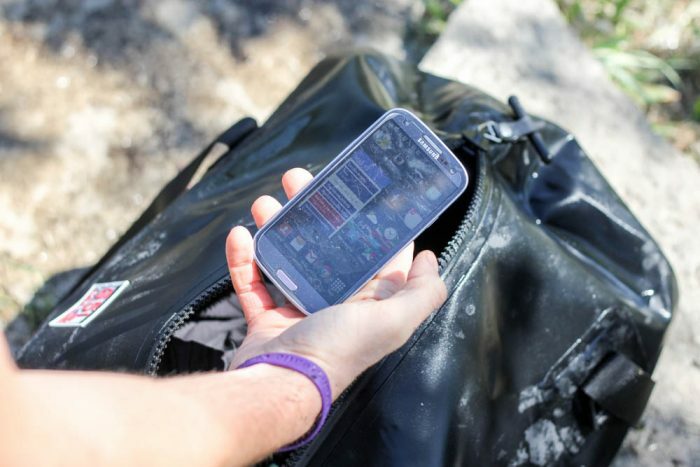 I set out to drown the bag and see if its contents – a bunch of dirty laundry, some shoes, a full gallon jug, and a functional smartphone – remained dry (and operable). Fully loaded up the bag weighed about 35 pounds. Its assorted garments, gear, and miscellany were masked by the thick polyurethane shell – not a major selling point, but it was nice to have a duffel that didn’t advertise what I was carrying. There was little doubt the shell, a thick rubbery fabric, would keep water out – the real test was the zipper. Fully waterproof zippers are not unheard of, but other features like roll-top closures are more popular. The benefits of the zipper are simplicity and the fact that you don’t have to leave empty space in the bag for closure as you do on a roll-top. I headed to the lake. At the water’s edge, the bag refused to go under without a fight (a good sign, if no air is going out, no water will go in). In the end, I managed to hold the bag under for four minutes without a single bubble popping up. The duffel performed its duty as advertised. The laundry stayed dry and the phone stayed on. Though the bag is impervious to wet, the zipper absolutely must close all the way – this is not difficult, but users must be certain to feel a snap when it is fully closed. Twice I zipped the bag shut, only to notice I didn’t give that extra pull to seal it closed. This is a great, if simple bag. 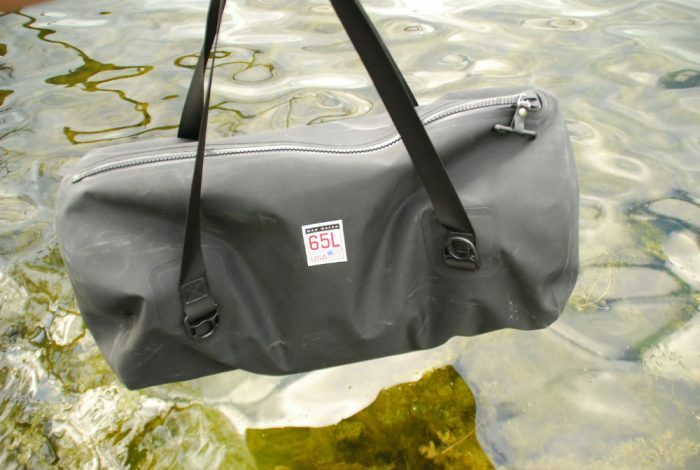 It’s ideal for carrying your dry needs on a kayak or canoe trip, or pulling behind if you swim the English Channel. It’s also an easy-to-use travel duffel that will keep your stuff dry if disembarked into the rain. The Mad Water does command a respectable sticker price, though – from $160-$260, depending on size. For similar-size “weather resistant” duffels, that’s pricey. But the bag looks and feels durable, and in the weeks we’ve been tossing it around, it’s remained as new. The bag is available for sale now on the Mad Water website in 30-, 65-, and 90-liter sizes.